Namesake - Florence Schneider served at Western for 43 years as a secretary, bookkeeper, registrar, and bursar. She worked for the first three presidents. She came to WKU in 1910 and retired in 1953. She was born in Bowling Green and attended St. Columbus Academy and graduated from the Bowling Green Business University. In 1971, at the age of 81, she past away. 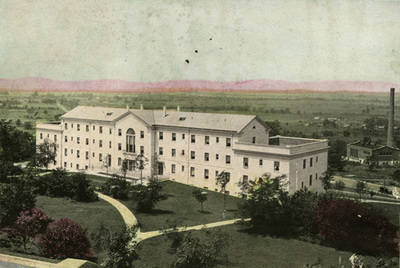 History - West Hall, (the building’s first name-given because of its occupancy of the Western slope) was an all-girls dorm when it first opened. It had three stories with a lobby and bedrooms to accommodate 200 girls. The bedrooms were a suite style which had one bathroom between two bedrooms. There was also a much larger room on the second floor that was used for conferences, recreation, study, and general use. On the third floor was an infirmary. This was equipped with metal hospital furniture, diet kitchen, and living quarters for the school nurse. The girls could visit the nurse at no extra charge. The building was constructed of "Bowling Green stone". During WWII, air force troops were stationed in the building. In 1977 the building was converted into a "continuing education center". However, in 1980 the building was converted back into a woman’s hall because of a housing shortage. In 1984, the dorm was shut down because of declining women enrollment. During that time, the building was rented out for conference rooms and office space. In 1987, the first two floors of the dorm became a co-ed dorm. The third and fourth floors were used for the "Continuing Education" program, the sheriff’s academy, and university guest housing. The building now houses the Carol Martin Gatton Academy of Mathematics & Science.